Today, NVIDIA has announced two new additions to its GeForce 7-series product stack. The GeForce 7900 GS should be available to buy by the time you've read this, while GeForce 7950 GT will not be available to buy until September 14th. GeForce 7900 GS is a cut down version of the GeForce 7900 GT - it is based on the same G71 graphics processing unit and comes with the same 256MB of memory. However, it comes with only 20 of the 24 pixel pipelines enabled. NVIDIA has also docked one of the vertex shaders too, meaning that there are only seven. 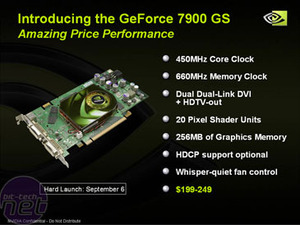 The GeForce 7900 GS' clock speeds have remained the same as the GeForce 7900 GT's, though, so it's running at 450/1320MHz. There is optional support for HDCP - that is down to the partners - and the cards are expected to cost around £150 in the UK. 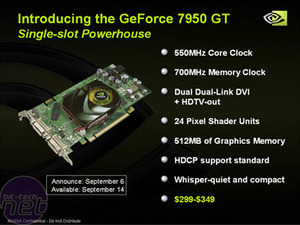 Meanwhile, GeForce 7950 GT is basically a souped up GeForce 7900 GT. It comes clocked at 550/1400MHz with 512MB of memory. HDCP support comes as standard, and all parts of the G71 GPU are enabled. It should perform very similarly to the GeForce 7800 GTX 512, although it will be a little slower in memory-intensive scenarios. We don't have any UK pricing forecasts at the moment, but it is expected to cost around $299-349 in the US. Normally, we would have a launch day review but NVIDIA's increasingly demanding deadlines are starting to get a little bit silly. NVIDIA talked to us about these new products for the first time - on official terms - on Thursday. It wants us to co-incide our reviews with the on the shelves dates it has set out. That means you will see GeForce 7900 GS reviews around the net today, and GeForce 7950 GT reviews will follow on the 14th. NVIDIA has pushed all of the reviews out to its board partners, but some of the board partner cards we were sent didn't actually get here until Monday afternoon. That would have given us less than 48 hours to turn around a review; of course, we could rush our review to get it out on time, but we don't think that would be giving GeForce 7900 GS a fair shake. Please bear that in mind when you're reading other reviews around the 'net today. In the past, we have had plenty of time to review NVIDIA's products in time for a new launch, but since GeForce 7950 GX2, things have got a lot tighter - we had around five working days to get that done in time for the launch. We understand that there were some leaks from other publications on a previous launch and that is why NVIDIA has reduced the lead time on all of its reviews. However, we are disappointed with NVIDIA's stance on leaks because there is a lot of manual work involved in a bit-tech review - all of our benchmarks are run manually. Taking that into account, it is simply impossible for us to provide full coverage of NVIDIA's new products on its rather optimistic launch dates. We are told that things will change, but we're not going to be playing cat and mouse anymore. If NVIDIA wants us to give its products a fair shake in time for a launch date, it's going to have to start streamlining its launches. We will be doing a roundup of several partner cards over the next few days and if we get product in good time, we will be covering GeForce 7950 GT on the day it is available to buy in the shops.